Abstract Body: Comorbidity between Alzheimer’s Disease (AD) and type 2 diabetes (T2DM) is now well-established. One hallmark of AD is abnormal brain accumulation of beta-amyloid, which has been directly linked to central insulin resistance, and therapies that improve insulin signalling have been successfully tested as treatments for AD. However, although we and others have shown that diet-induced T2DM causes elevation of hippocampal beta-amyloid, this has not been targeted as a cause of the cognitive deficits seen in T2DM. 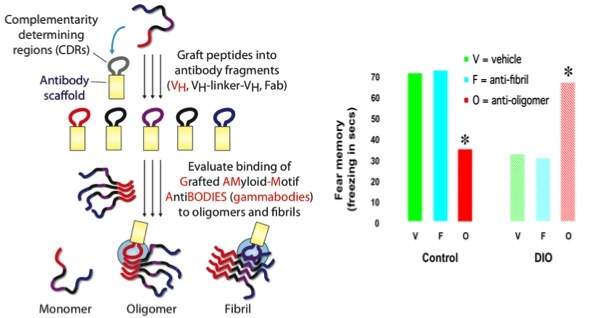 We have developed single-domain antibodies against conformation-specific forms of beta-amyloid; these Grafted AMyloid-Motif Antibodies (GAMMAbodies) are small enough to diffuse throughout the hippocampus when given centrally, designed to bind and sequester beta-amyloid. Here we show that hippocampal administration of an anti-amyloid GAMMAbody to animals with high-fat-diet induced obesity reversed cognitive impairment on a contextual fear-conditioning, while administration of a GAMMAbody specific for fibrillar amyloid had no effect. Interestingly, the active GAMMAbody impaired performance in control animals, consistent with previous findings that beta-amyloid plays an important endogenous role in hippocampal memory processes. Analysis of the molecular pathways altered by GAMMAbody delivery provides further insight into the specific mechanisms by which beta-amyloid impairs insulin signalling and hippocampal function, which is critical for intervention and prevention of AD. These data are the first to show that cognitive impairment in diet-induced obesity is directly linked to beta-amyloid even in the absence of AD, and offer an exciting new avenue for therapeutic treatment. Lay Language Summary: Our data show that not only is type 2 diabetes (T2DM) a major risk factor for cognitive decline and development of Alzheimer's disease (AD), but that in fact the cognitive and neural impairments seen in patients with T2DM may be entirely due to a pre-AD state characterised by abnormal elevation of oligomeric beta-amyloid in the brain. That is, our results suggest that all T2DM patients - some several hundred world wide - are on a spectrum of decline leading towards Alzheimer's. Over the past decade, it has become increasingly recognised that T2DM is a major risk factor for development of subsequent dementia, and specifically of Alzheimer's disease. Several large epidemiological studies have confirmed that T2DM may be the single largest cause of AD. This link is increasingly supported by molecular evidence: the brains of Alzheimer's patients show impaired insulin signalling, and studies primarily in neuronal culture systems have shown that insulin and beta-amyloid (Aβ) - the proteins whose over-accumulation defines T2DM and AD respectively - interact directly. Increased insulin prevents breakdown of Aβ, which then feeds back to block insulin receptors in what is likely to be a vicious spiral towards dysfunction and AD. We previously (Pearson-Leary & McNay, 2013) showed in vivo that Aβ directly impairs hippocampal signalling and metabolism: this new work shows for the first time that intervention to prevent Aβ binding can entirely reverse the cognitive impairment seen in a rat model of diet-induced T2DM, suggesting that abnormal accumulation of Aβ is a critical, causal step in diabetic cognitive decline even well before dementia occurs. Secondly, this report includes the first in vivo use of engineered antibody-domains against specific forms of Aβ, which are small enough to diffuse throughout the hippocampus and can be made specific against e.g. oligomeric Aβ, the form which has been suggested to be most toxic. 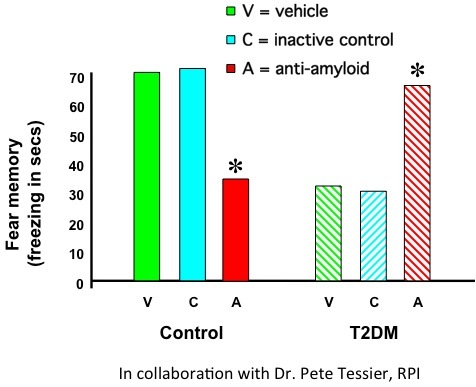 Our data confirm the potential therapeutic value of this exciting approach, and moreover demonstrate that in control animals, Aβ (likely in monomeric form) plays a key, procognitive role in hippocampal function: as with many other modulators of memory such as glucose or stress, a little amyloid greatly boosts cognitive function but too much is very bad.